Is a Honeymoon Cruise a Good Idea? I have a confession to make. Okay, deep breath, here we go. This may be even more shocking than when I wrote about why I used a travel agent to help me plan my honeymoon, but it’s true. Did I want to go on a cruise for my own honeymoon? No, but I can definitely see why people would choose to go that route. 1) Cruises are a stress-free way to see many destinations on one trip. Whether you want to check out a variety of Caribbean islands or multiple ports around the Mediterranean, you won’t have to worry about transportation between each place. No delayed flights, smelly trains, or confusing roadmaps to dampen your honeymoon! 3) It’s pretty impossible to get bored on a cruise ship these days. Between the rock climbing walls, the spa, the shows, the ice skating rink, etc., your days at sea can be as active or relaxing as you’d like. Even though there are a lot of good reasons to cruise, there certainly are some turn-offs as well. You can’t be flexible about your itinerary, cruise ship cabins can be comically small, and some cruises have strict seating assignments and meal times. Despite the monstrous size of cruise ships these days, some people feel claustrophobic nonetheless. 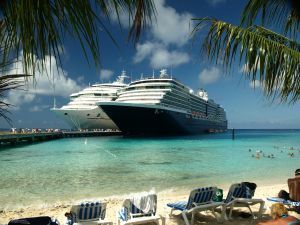 So, would I recommend cruises for everyone? Absolutely not. But I do think that a lot of people are inaccurately judgmental of cruises. That being said, it’s really important to do your research before you do book a cruise. Cruise lines cater to a wide variety of clientele, so your experience on a fancy shmancy Silversea cruise will most likely be a completely different story than if you chose a more casual Carnival cruise. My family always preferred cruising on Royal Caribbean because it wasn’t too uptight and formal, but it was a lot more posh and impressive than some of the more “young and fun” cruise lines. You get what you pay for on cruises, so make sure that you’re not getting a “too good to be true” deal. *I personally think that one of the very best parts about traveling abroad is trying new foods, so by no means am I saying that you should eat all of your meals on-board. However, cruise ships can be much more accommodating to people with dietary restrictions than many local restaurants, especially if you need to deal with a language barrier in foreign countries.